Used Audi TT Review - 2006-2014 | What Car? 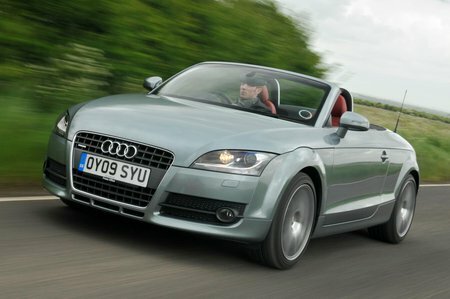 Which used Audi TT sports should I buy? Don't be put off the 2.0-litre 197bhp TFSI version. It feels more alert than the heavier V6, and sounds great under hard acceleration. The 3.2-litre 247bhp V6 is faster and comes with four-wheel drive as standard to make the most of the extra power. In 2008 Audi introduced a 2.0-litre 168bhp TDI diesel TT. The smooth engine has got plenty of pull, so you can afford to be lazy with the gearchanges. It comes with quattro four-wheel drive as standard, but the best feature is the low 138g/km CO2 emissions. The standard six-speed manual gearbox is slick and well matched to the engines, but the optional S-tronic semi-auto is slightly more fuel efficient and will change gear faster than you can. Some TTs also have the Magnetic Ride suspension system fitted, which can be used in Comfort or Sport settings, although the standard suspension is brilliant anyway. Equipment levels are good, with climate control, alloys, electronic stability control, curtain airbags and half-leather sports seats as standard. Metallic paint is essential for good residual values.